About a decade ago, Noel Brockett got an education in a subject he never thought he’d study: How to give a toast. It turns out, there’s a lot more to it than raising a glass and calling out “cheers” — especially for a tamada, or toastmaster responsible for leading traditional Georgian feasts, also known as supras. “It’s not as easy as it may look,” Brockett said. That’s because the tamada is the glue that holds the meal together. Each supra is structured around a handful of standard toasts shared throughout the dinner — there’s always a toast to God, a toast to those who have departed and a toast to women. Then, several more are added in depending on the celebration (formal supras, such as weddings, have upward of 30 toasts) and the conversation at the table. These days, Brockett is showing off his tamada skills at monthly supras hosted at Supra, a Georgian restaurant located in D.C.’s Shaw neighborhood. 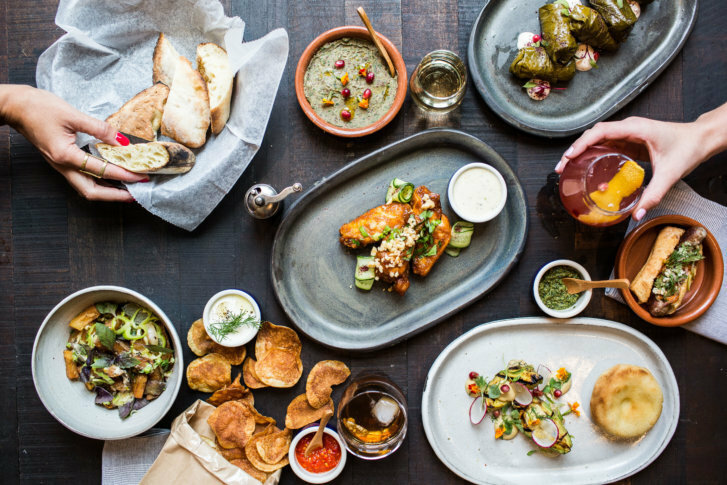 Owners Jonathan and Laura Nelms opened Supra in 2017 after returning to D.C. from Moscow, where he worked as a partner for the law firm Baker McKenzie. Their motive was twofold: They missed the abundance of Georgian cuisine that was once at their fingertips. “Living is Moscow, there are Georgian restaurants on every corner. We liken it to Mexican or Italian food here,” Jonathan said. They also saw room for a Georgian restaurant in D.C.’s growing and diverse dining scene. What is Georgian food, exactly? Jonathan described the cuisine as “unique,” and one that’s made up of a blend of familiar flavors, rather than a few defining ingredients. “I think the one-sentence explanation we often give is that it’s a little combination of Mediterranean and Middle Eastern,” he said. Perhaps most popular dish, at least at Supra, is khachapuri, a cheese-filled bread that’s topped with an egg. Kebabs, salads, vegetable pâtés and soup dumplings, or khinkali, are also common. “Georgia’s on the western edge of the Silk Road, so they have some things connecting them to Asia, even though it’s not a particularly Asian culture,” Jonathan said. All of these dishes, plus plenty of Georgian wine, make it to the table at Supra’s monthly family-style feasts. Beyond food, the Nelms want to give local diners at these events a taste of the traditions they experienced in Georgia. On their fifth wedding anniversary, the couple attended a supra in Kazbegi and dined with strangers. The chacha (or Georgian grappa) was flowing, and so were the speeches from the table’s tamada. “It was so moving because we didn’t know these people at all, but it was very heartfelt and sincere in the way that they were expressing themselves,” Laura said. Tickets to the supras at Supra are $125, and include all food, wine, taxes and tip. Be sure to free up some room in your stomach — and in your schedule. The dinners last around three hours.